“Made in Brazil”: Human Dispersal of the Brazil Nut (Bertholletia excelsa, Lecythidaceae) in Ancient Amazonia. The Brazil nut, Bertholletia excelsa, is a colossal tree of terra firme forest whose seeds represent the most important non-timber forest product in Amazonia. Its peculiarly inefficient dispersal strategy and discontinuous distribution have led some to hypothesize anthropogenic origins, but evidence to date has been inconclusive. Here we present results of a multidisciplinary study addressing this question. A review of the geographic distribution of B. excelsa and comparison with that of similar Lecythis species suggest a number of anomalies that are consistent with a recent and wide colonization of Bertholletia. Published studies and field observations indicate that anthropogenic disturbance facilitates Brazil nut regeneration. Recent genetic studies showing no sequence diversity and no geographical structuring of within-population variability support a rapid and recent irradiation from an ancestral population. Historical linguistic analysis of indigenous terms for Brazil nut suggests a northern/eastern Amazonian origin for Bertholletia, with a concomitant spread of Brazil nut distribution or cultivation to the south and west. Such an expansion would have been particularly facilitated by the emergence of intensive bitter manioc cultivation and networks of interethnic trade beginning in the first millennium C.E. Together, ecological, phytogeographic, genetic, linguistic, and archeological data reinforce the hypothesis that ancient Amazonian peoples played a role in establishing this emblematic and economically important rainforest landscape. Received 11 February 2010; accepted 12 December 2010. 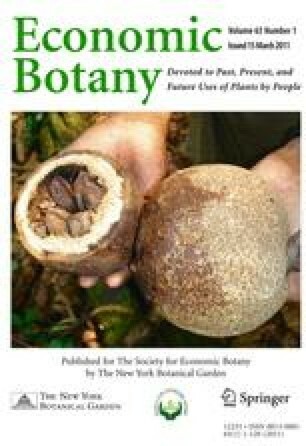 ‘Made in Brasil’: A dispersão antrópica da castanha-do-Pará (Bertholletia excelsa, Lecythidaceae) na antiga Amazônia. A castanha-do-Brasil, Bertholletia excelsa, é uma arvore enorme da terra firme cujas sementes representam o produto florestal não-madeireira mais importante da Amazônia. Alguns pesquisadores, observando sua estratégia ineficiente de dispersão e sua distribuição descontínua, propuseram a hipótese de que suas origens são antrópicas, mas as evidencias até a data são ambíguas. Aqui se apresentam resultados de um estudo multidisciplinar sobre essa questão. Uma revisão da distribuição geográfica de B. excelsa e uma comparação com as sapucaias (Lecythis spp.) sugerem várias anomalias compatíveis com uma recente colonização de Bertholletia pela Amazônia. Estudos publicados e observações em campo sugerem que a perturbação antrópica facilita a regeneração de castanhais. Estudos genéticos recentes demonstram nenhuma diversidade genética de seqüências de cpDNA e nenhuma estruturação geográfica da variabilidade intra-populacional, o qual sugere uma expansão rápida e recente. Estudos lingüísticos sugerem uma origem para Bertholletia no norte/leste da Amazônia, com uma expansão mais recente da distribuição ou cultivação para o sul e o oeste. Tal expansão teria sido facilitado pela emergência do cultivo intensivo de mandioca amarga e redes de contato inter-étnico especialmente a partir do primeiro milênio dC. Dados ecológicos, fitogeográficos, genéticos, lingüísticos, e arqueológicos reforçam a hipótese de que os povos amazônicos antigos tiveram um papel significante no estabelecimento dessa paisagem amazônica emblemática. The authors wish to acknowledge Rogerio Gribel and Maristerra Lemes for support and research collaboration in the early phases of this study. We also acknowledge Eduardo Góes Neves and the Museum of Archeology and Ethnology at University of São Paulo for support during a later phase of the research. We thank Manuel Arroyo-Kalin for many useful suggestions on a draft of the paper. We also thank Sylvain Desmoulière for kindly sharing unpublished geographical analyses of RADAM-Brasil inventory data on the Brazil nut. Thanks also to Carlos Peres for sharing data, observations, and photographs during various drafts. We thank Scott Mori and two anonymous reviewers for their careful reading of the manuscript and many helpful comments and revisions. We acknowledge Denny Moore for urging caution in our linguistic interpretations. Finally, we thank Joshua Birtchall for helpful comments on the final draft of some figures. Different phases of the research were supported by Brazil’s Conselho Nacional de Desenvolvimento Científico e Tecnológico (CNPq) and Fundação de Amparo a Pesquisa do Estado de São Paulo (FAPESP). Regional, vernacular, and indigenous terms for Brazil nut (Bertholletia excelsa), researched and organized by H. Ramirez. All vernacular terms were collected in the field except where bibliographical sources are noted. noix du Brésil (French) < *Latin nuc(e) “fruit of a european tree (Juglans regia), or any similar kind of fruit with an almond” < *Indo-European knu(t). Brasil nut (English) < *Germanic knut “hard seed” < *Indo-European knu(t). NOTE: The German and English words for the peanut (Arachis hypogaea) have been formed from the same linguistic root: pea + nut in English and erd + nuβnut of earth in German. castanha (Portuguese), castaña (Spanish) < *Latin (nux) castanea “nut of the chestnut tree (Castanea vesca) or any similar kind of fruit < *Greek kástanon < Asiatic language (cf. English chestnut < *Old English chesten nut < *Old French chastaigne “chestnut”). almendra (Spanish, cf. Portuguese amêndoa, French amande, English almond) < *Latin amygdala “almond” < *Greek amygdále “ amygdalis”. to(ro)cari (Brazil of XVIIIth century) < probable Carib loan, with the non-Carib suffix -ri. touca (French Guiana) < probable Carib loan: tutuka in Kari’ña. yuviá, jubia (Venezuelan Spanish) < loanword from an unknown indigenous language. NOTE: Terms are organized by linguistic families. Roman numbers (I, II, III, etc.) indicate the subfamilies, while letters (Ia, Ib, Ic, etc.) show further subgroupings. New internal classifications have been suggested here by H. Ramirez for Arawá, Arawak, Chapacura, Carib, and Pano families. Where ongoing lexico-statistical study permits, suggestions for language family time depth are provided in parentheses. Supplemental terms for “peanut,” “nut,” etc. are provided where relevant. Cahuapana xiwako’, monopi, tanpa’pi nuts spp.